1. Workplaces continue to provide commodity coffee whereas outside the office on the streets speciality coffee has taken over. Staff will not drink from a pod machine when theres incredibly goood coffee outside! That costs the office in downtime. Big time. We estimate around $8k per employee per year. Bad coffee at work is the new “smoking” cost economically. 2. Espresso machines at work are never clean, never maintained, and no one usually knows how to use them properly Espresso. When a staff member does know they create a waterhole experience of 20-30 minute ling waits while the barista makes coffees. Benefits of espresso is that it’s ground fresh. 3. Pod machines are bad for the environment, use PREGROUND coffee which is never okay, and really don’t cut it using 4 grams only per pod. They are actually more similar to filter coffee than espresso. Benefits of pod machines is they are very consistent and very fast. 4. Filter coffee options have classically been steeped, percolated low quality coffee, and often sit on hot plates baking all day. This is all bad. 5. Milk at work is usually poor quality and often UHT. If you go to a specialty cafe outside they will have high quality biodynmaic milk. 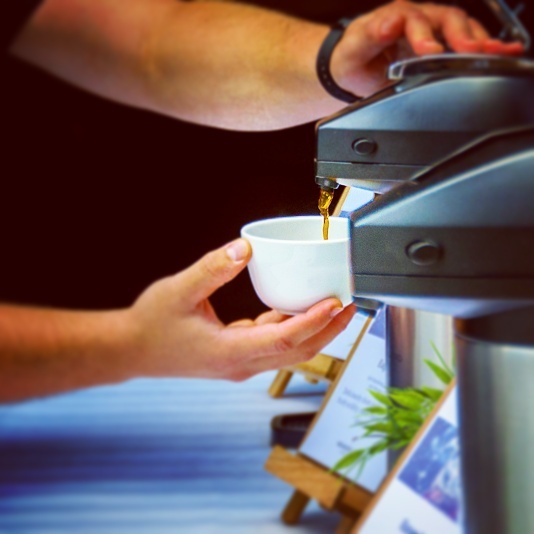 Promised Land Coffee delivers Melbourne’s best Batch Brew to workplaces a daily basis. You don’t need milk because filter coffee is sublime balanced and sweet in its own. It has superior quality to pourover at a cafe. Superior consistency to a pod machine. The speed of a pod machine and is environmentally friendly. ← Is Hillary the lesser of two evils?